This upma with raw rice is my favourite. It is called Arisi upma and it is a very well-known tiffen item in south India. The preparation is very simple and this dish is delicious with coconut chutney. However my favourite side dish for this food is tomato chutney. It is advised to soak the rice for 4 hrs and dry them in hot sun before grinding. However, I do it without this step. Either way it tastes great. But, if you want to follow the correct way of doing this dish, I would suggest you to dry the rice before using it for this preparation. Coarsely grind the rice and the whole pepper it in a mixer/blender, little by little so that all the rice are evenly broken. You can either do this with pressure cooker or you can also use a heavy based vessel or kadai. Heat the oil in the vessel and add mustard seeds, cumin seeds, red chillies, channa dal, hing and curry leaves. Then, add the onions and saute them well until the onions start changing colour. Add the coarsely ground rice and saute for a minute. Pour 3 cups of water and add salt and stir well. When the water starts boiling you can either off the stove and transfer the contents the pressure cooker or you can continue to cook in the same vessel in Sim flame. If you choose to use the vessel to cook, make sure that you watch at regular intervals and stir occasionally so that the food doesn't get burnt. If you choose to pressure cook, then wait for 4 whistles. Switch off the stove and allow it to cool. 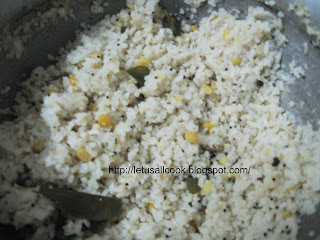 Arisi upma is our favorite too, but we prepare it without onion and use coconut instead. Recently I also tried it using corn grits and it also was very tasty. Thats my favorite too. Now a days, I am not making it often. Hi Sangeeth, I love arusi upma, especially in combo with puli gojju :-)Acquired taste from a periamma, she used to make and store loads of this mix at home. and arusi upma could be made in a jiffy.